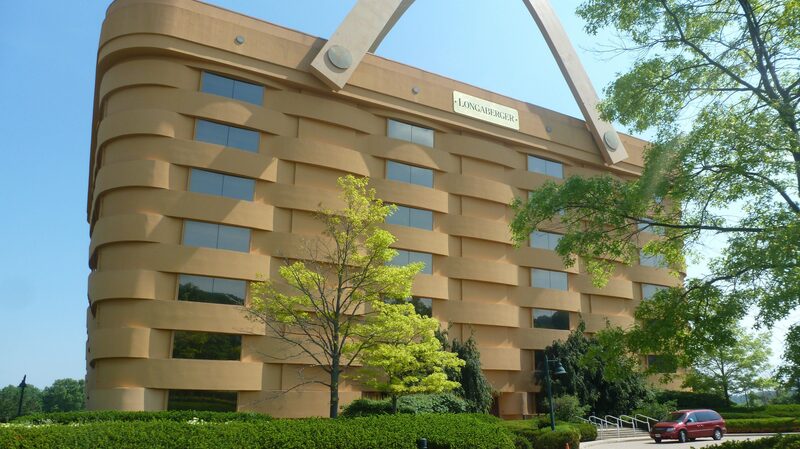 The Longaberger Basket Building, the Newark, OH, office structure built to resemble a giant picnic basket, is heading to foreclosure if the home goods company does not pay more than $600,000 in back property taxes. Olivia Parkinson, the Licking County treasurer, tells realtor.com® that the county recently sent a letter informing Longaberger that it is referring the property for tax foreclosure. The company, which hasn’t made a tax payment since November 2014, owes $605,219.12. In order to halt foreclosure proceedings and an eventual property auction, the company must pay the bill in full within two weeks, Parkinson says. The one-of-a-kind property has lingered on the market for 18 months. Brenton Baker, a spokesman for the Longaberger Company, says serious negotiations are underway with “several entities” who’d like to pack their employees into the basket building. It’s been tough to find a buyer for the 180,000-square-foot building in a suburb of Columbus. The basket landed on the market for $7.5 million about a year and a half ago, and the price has since been slashed to $5 million. The current asking price works out to about $27 per square foot, roughly half of what area office space—that doesn’t look like bologna sandwich storage—typically commands. Longaberger, which sells baskets through a national network of Tupperware-style home consultants and is now owned by JRJR Networks, completed the office building in 1997 at a cost of approximately $32 million. 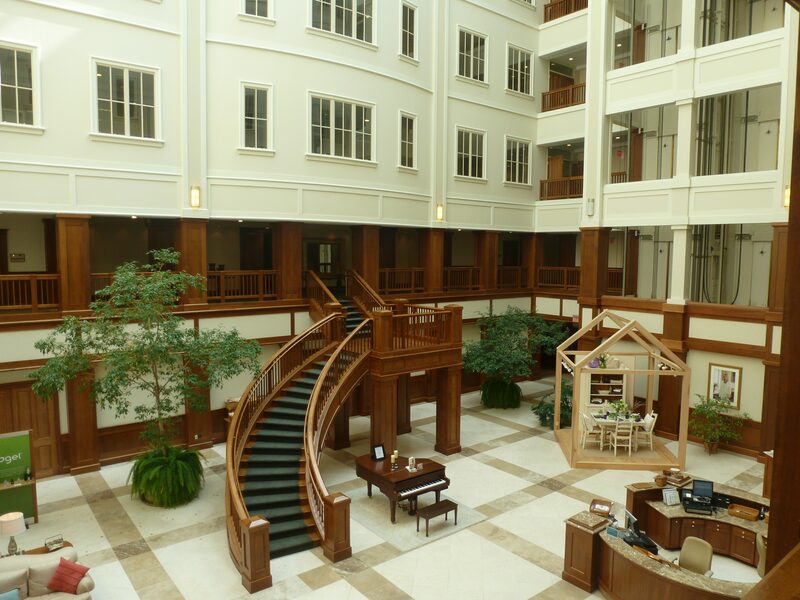 It was the brainchild and dream project of the company’s founder, Dave Longaberger, who wanted his headquarters to mimic his best-selling basket. And so they did, handles and all. The exterior consists of stucco-covered framed metal set in a basket weave pattern. Two 75-ton handles heated to prevent ice from forming grace the top of the basket, and two 725-pound gold leaf Longaberger tags adorn the sides. The interior contains a 30,000-square-foot atrium and a 142-seat auditorium, where employees used to gather for movie night. “It was a great home for us for many, many years,” says Baker, who’s worked for the company for 25 years. The final employees emptied out of the basket in July. It also was a tourist destination. TripAdvisor, which calls the building “World’s Largest Basket,” ranks it No. 6 out of 19 things to do if you happen to be in Newark. The Dawes Arboretum is No. 1. But after Dave Longaberger died in 1999, tastes in home décor changed and sales slumped. The company’s revenue shrank from $1 billion in sales in 2000 to about $100 million in 2014. In fall 2014, the company was nipping away at the back taxes it owed, paying $10,000 per week for eight weeks, says Parkinson. But the payments stopped in November 2014. Those delinquent taxes are “the scary part” for prospective buyers, says McDonald. “Heating and cooling costs must be phenomenal. Plus, it looks like a basket.” A basket in need of a paint job, according to a TripAdvisor comment posted in August. This entry was posted in Bedford and tagged Bedford Real Estate, Bedford Real Estate for Sale, Bedford Realtor on October 9, 2016 by Robert Paul.